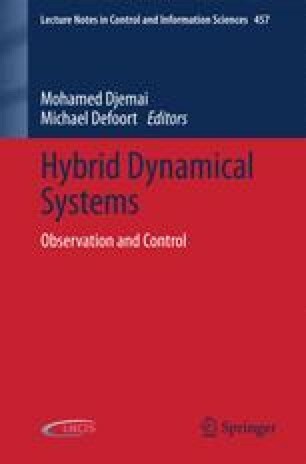 This chapter addresses the observer design problem for a class of continuous-time dynamical systems with nonuniformly sampled measurements. More specifically, an observer is proposed that runs in continuous-time with an output error correction term that is updated in a mixed continuous-discrete fashion. The proposed observer is actually an impulsive system as it is described by a set of differential equations with instantaneous state impulses corresponding to the measured samples and their estimates. In addition, it is shown that such an impulsive system can be put under the form of a hybrid system composed of a continuous-time high gain observer coupled with an inter-sample output predictor. The proposed observer present two design features that are worth noting: First, the observer calibration is achieved through the tuning of a scalar design parameter. Second, the exponential convergence to zero of the observation error is established under a well-defined condition on the maximum value of the sampling partition diameter. Simulations results dealing with a flexible joint robot arm are given in order to highlight the performance of the proposed observer.